The Nexus 7 was not the only thing that Google unveiled yesterday, it was only the thing everyone was expecting. The thing no one was expecting however was the Google Chromecast! 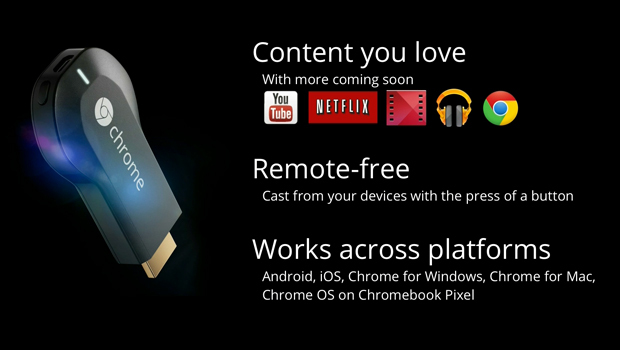 Basically this device is running a lighter version of the Chrome OS (didn't know it could get lighter) and you can use it on your TV. Does this mean that you'll be able to use your TV as a computer? No. So this brings us back to wondering, what is it? Basically this dongle is going to allow you to take that video you are watching on your phone or tablet or PC and watch it on your TV. You can also use it to play your music on the TV as well. My first concern with this was "Will it kill my battery since the phone is sending all that information to the device?" Well, that's not an issue. When you are watching a YouTube video, a Netflix video or playing music from Google Play on your phone, you can click on a button and have the information go to the Chromecast. 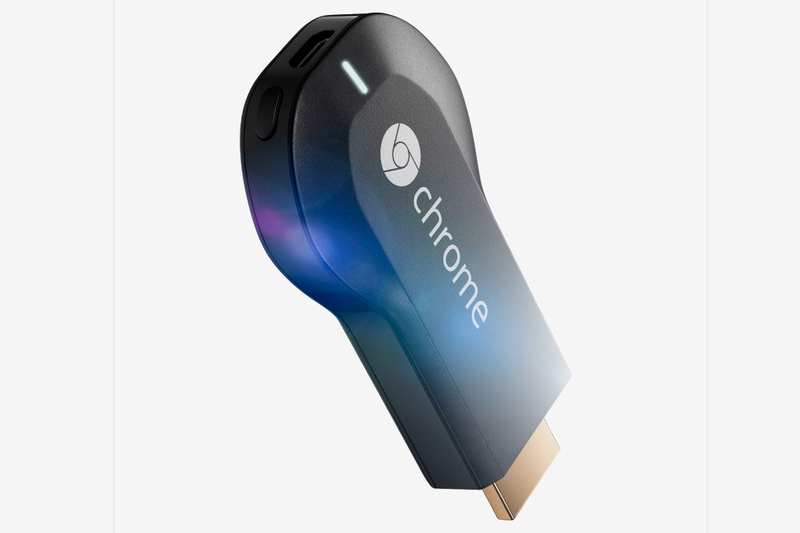 The Chromecast simply receives a link, it goes online and looks up the information itself. You can then use your device or devices in order to control the playback. The information as far as I know is not streaming from the phone to the device. This however brings me to a question which I have not been able to answer yet, what if I have a video on my device locally, will I be able to stream it to the Chromecast the same way I would with a Samsung smart tv? I honestly don't know that information yet. 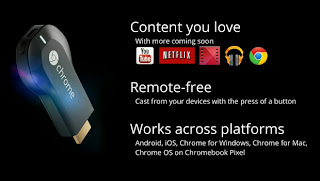 You do NOT have to use Android to take advantage of this device, you can use your PC or Mac running the Chrome Web browser, it'll allow you to browse the web from your TV. You can also use your iPhone or iPad. Basically plug it into your TV's HDMI input and do a quick one time set up online. Right now only a few applications support it, but hopefully there will be more coming. Ok, I like it, but How much? I've seen similar devices before that are very limited as to how you can use it or what devices you can use it with, they are usually in the $100 range. The Chromecast however is available now and it only costs $35. With a cost of $35 this is certainly a must have in just about any household that has any kind of smartphones or tablets. Is it a device you'll use a LOT? That depends on how often you use things like YouTube or Netflix. But really even if it's helpful every now and then, for $35 it seems worth it. Some newer TV's may be able to power the device using just HDMI however for some older TV's you will need to plug it in using USB and the USB port on some of these TV's may not be good enough, so you may very well end up having to plug it in to your power strip. Personally I am very excited about this product and I can't wait to get one! Today Google announced a couple of things that I'd like to talk about. In this case I'll talk about the New Nexus 7! 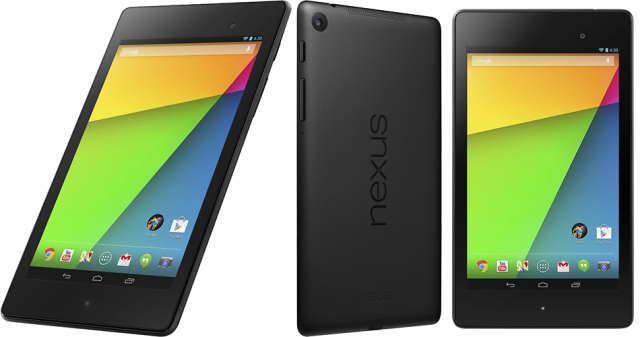 This new Nexus 7 tablet will obviously replace the old Nexus 7 and it will begin shipping on July 30th. So what is so special about this new Nexus 7? The screen on the old Nexus 7 was never a bad screen, for such a cheap tablet it was actually pretty good. However this new screen comes in with a resolution of 1920 X 1200. This is supposed to be the highest PPI tablet on the market now. Of course that probably wont be for long. It's nice however to see the Nexus 7 screen right up there with the beautiful screen of the older (although not so much) Nexus 10. The old Nexus 7 used to run on the Tegra 3 processor, which was a great processor, it also had 1GB of ram on it. The New Nexus 7 will be running a Quad Core Snapdragon S4. On paper the difference doesn't seem that big, both are Quad core processors, the old one was 1.3Ghz and the new one is 1.5Ghz but I believe the S4 processor has proven to be a much nicer processor than the Tegra 3. The new Nexus 7 now also has 2GB of ram which should help it even more. The new Nexus 7 has a few other things that I figured I'd mention. First is the GPU, it uses the same GPU as the Galaxy S4. It also has a HDMI out port which is for the most part useless but every now and then you do want to use it. Another thing that I absolutely love that I'm sure a lot of people will find useless is the addition of Qi Wireless charging. I know plugging it in is not that big of a deal but I am in love with Qi charging. The one thing that puts this tablet down some is the fact that it is actually more expensive than the previous model, which is a bit weird because normally electronics stick to a specific price point if they are replacing a previous model. Are the extra things like Qi Charging, HDMI Output and a higher res screen worth the extra $20-$30? Personally, I think so.